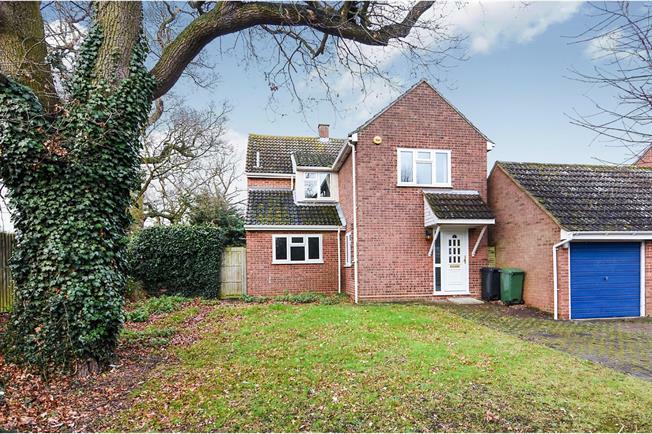 4 Bedroom Detached House For Sale in Braintree for Guide Price £410,000. Offering close to 1500 sq ft of accommodation over two floors, this substantial house is ideal for a large or growing family. To the ground floor there are a choice of reception rooms (including a play room), large kitchen breakfast room and ground floor WC. To the first floor four double bedrooms, bathroom and En-Suite to the Master. The property has been sympathetically extended over the years to both floors to a size you will just have to come and see! This property occupies an enviable plot, with the house set well back from the road. The frontage offers extensive lawns including mature trees and bushes. There is a single garage which is detached from the property, and a long driveway. The lawn to the front could also provide off street parking for numerous vehicles such as a caravan or motor home, if required. To the rear, the back garden is mainly laid to lawn, with high tree borders, and a summer house in the corner. The garden is large enough to extend further or add a conservatory (STP). The long entrance hall is part of an extension to the front of the property and provides access to the sitting room, play room and ground floor WC. The first room on the left as you enter, the ground floor WC offers a wall mounted sink and low level toilet. This generous sized reception room could have a multitude of uses, including; play room, office, cinema room or gym. Independent from the other reception rooms, it provide privacy from the rest of the house. Across the rear of the property is the main sitting room, with glass doors looking out across the garden, stairs leading to the first floor and an opening to the dining room. A further independent room is the formal dining room. There is a window overlooking the garden which fills the room with light and door leading through to the kitchen. Located at the front of the property, the kitchen breakfast room is a great space with units at both eye and base level and more than enough room for a less formal table and chairs. There is a window to the front over looking your generous front lawn, and a side door out to the garden. At the front of the property, the generous Master bedroom is a comfortable king size room with access to its own private En-Suite shower room. The Master En-Suite comprises; double walk in shower, low level toilet and sink unit set within a vanity unit. A good size double room at the rear of the property with views over the garden. A further double at the rear, with a handy recess for fitted wardrobes. Either a double or generous sing room, bedroom four has a sky light filling the room with light and a storage cupboard. At the top of the stairs is the family bathroom, which is a fully tiled room with a white suite including; panel enclosed bath with shower, low level toilet and pedestal sink. This property occupies an enviable plot, with the house set well back from the road. The frontage offers extensive lawns including mature trees and bushes. To the rear, the back garden is mainly laid to lawn, with high tree borders, and a summer house in the corner. The garden is large enough to extend further or add a conservatory (STP). There is a single garage which is detached from the property, and a long driveway. The lawn to the front could also provide off street parking for numerous vehicles such as a caravan or motor home, if required.